Social networking sites have become more visual. This is especially the case with Pinterest. The site, which consists of images and videos arranged in a bulletin board style layout, has become one of the largest social networks. Unlike Facebook and Twitter, which rely on content from a network of friends and followers, Pinterest focuses on the “interest graph” and is made up of people who gather around topics of interest rather than relationships. Pinterest also offers more marketing potential than other social networks. Pinterest drives more traffic to websites than Twitter, LinkedIn, Google+, and YouTube, according to some reports. One in five Pinterest users purchase an item they have seen on the site — an average of about $80 per purchase — twice that of Facebook buyers. With that in mind, here are 10 ways ecommerce businesses can use Pinterest more effectively. Merchants should set up a Pinterest business account. Businesses that wish to join Pinterest should set up a business account. Complete a form that asks for information about your business, and agree to Pinterest’s terms of service. Verify your website to show Pinterest users that you are a trustworthy source. Verified accounts help more potential customers find you. Companies that started using Pinterest prior to the launch of business accounts can convert by completing a form. Pick a profile image such as a logo that helps people easily recognize your business. Profile images should be scaled to 160×165 pixels. Include a short description to introduce your company’s interests to Pinterest users. Create a variety of boards that show off your brand’s personality and taste, and add enough pins to make each board feel substantial. Pinterest suggests that, prior to starting to pin, you consider what users care about and tailor your strategy to address them. People can choose which boards they want to follow, so not every board has to appeal to everyone. Choose a compelling cover pin for each board that gives people a sense for the content contained there. Pinterest users want to be inspired, which is something low quality images won’t likely do. Images that are at least 600 pixels wide look best and only images that are at least 100×200 or 200×100 are pinnable. Instead of merely showcasing your products, Pinterest recommends that you show what inspires them by creating boards for the ideas, places, people, and moods behind your brand. “The very best boards are inspiring, with beautiful images that draw people in,” states Pinterest. 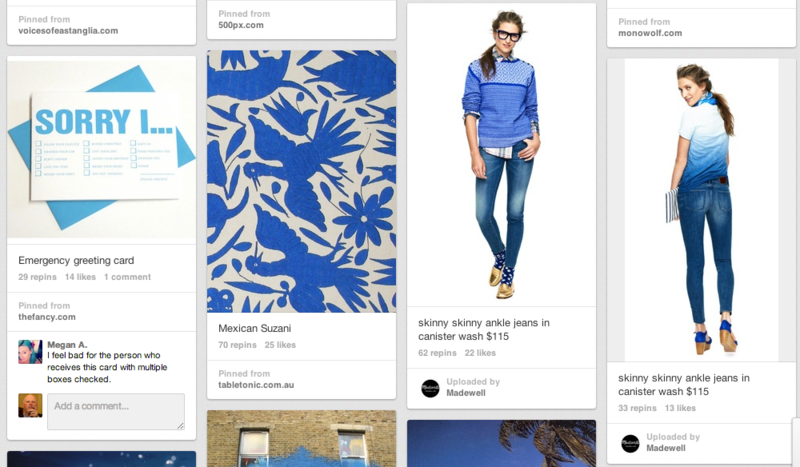 Fashion retailer Madewell creates pinboards that inspire through the use of color. Follow these steps to create a button or widget. Go to the Widget Builder page. Five types of buttons or widgets are available: Pin it buttons, Follow buttons, Pin Widgets, Profile Widgets, and Board Widgets. 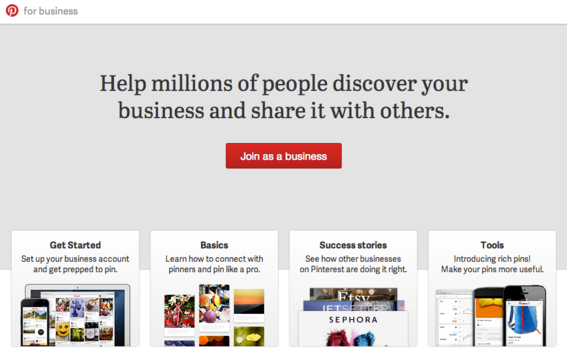 Pinterest offers buttons and widgets for use on ecommerce websites. Click on the option you wish to embed. Depending on the one chosen, you may be required to include additional information such as the URL where the button or widget will appear and an image to associate with it. Click “Build It!” to create the widget code. 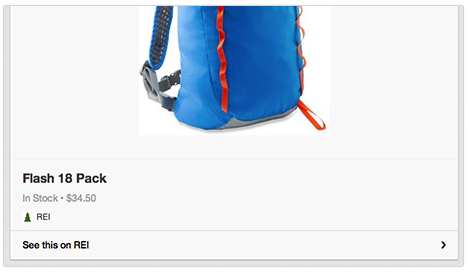 One of the options listed above — Board Widget — enables users to embed entire pin boards on their website. 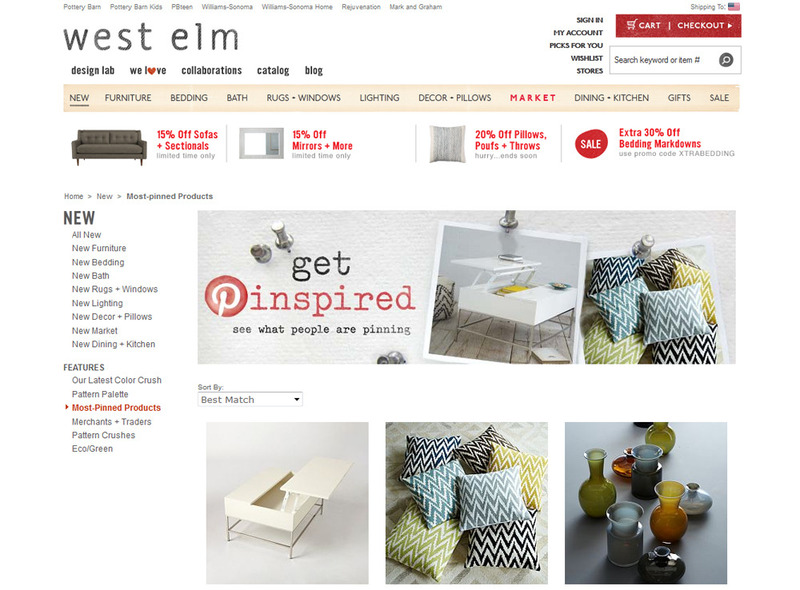 For example, furniture and home decor retailer West Elm shares its most popular pins on its website. West Elm shares its most popular pins on its website. Pinterest recently created a new type of product-related pin called “Rich Pins” that includes details like pricing, availability, and where to buy. Product pins include real-time pricing and availability. Include automatically updated details, like price changes. Setting up product pins is not a simple matter, however, and implementing them will likely require the assistance of a developer. 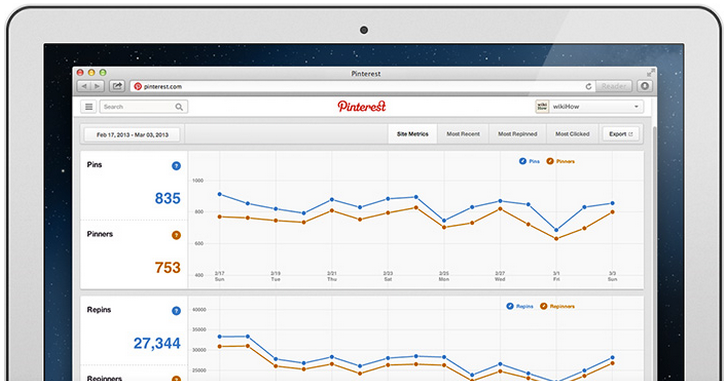 Pinterest Analytics shows popular pins and those that drive traffic. Pinterest Analytics shows pins that are most popular with users along with the ones that drive the most traffic to your site. You can also see what boards your content appears on, how the pins are described, and what people pin along with yours — insights that can help you make decisions about merchandising, product development, and your pinning strategy.